Leader says party is looking to “new challenges” including getting involved in Northern political scene and changing what it means to be in Opposition. FIANNA FAIL leader Michéal Martin has said that his decimated party is looking at entering the political scene in the North. He said the party was “actively considering” a move towards getting involved “on the ground” in Northern politics, although he denied that it would be as part of a merge with the SDLP. We are a republican party and we will advance that postition. He said the party had taken on lots of work in peace and reconciliation and wanted to extend that participation. I picked up behind all of the anger that people undoubtedly have is that we must change the way we do politics. They don’t want opposition for the sake of opposition. 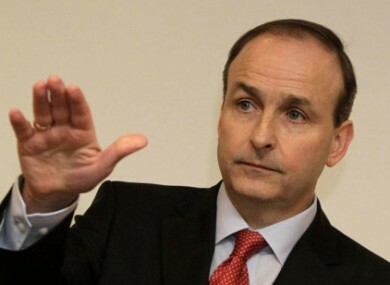 Email “Michéal Martin says Fianna Fail may now look to Northern Ireland”. Feedback on “Michéal Martin says Fianna Fail may now look to Northern Ireland”.